The breakfast was great, hotel was clean and our stay was perfect! Would like a microwave of fidge in room. Overall loved.location, very quiet, and bed was very soft and wadrm. Where to find Tinley Park hotels near an airport? Where can I find hotels in Tinley Park that are near tourist attractions? Tinley Park offers visitors to Chicago a terrific assortment of quality accommodation possibilities to select from. On our comprehensive booking pages you can browse 22 hotels within 0.1 kilometres (0.06 miles) of central Tinley Park. 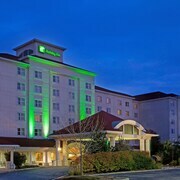 Accommodations in walking distance of the Tinley Park city center, are the Holiday Inn Chicago-Tinley Park-Convention Center and Fairfield Inn & Suites Chicago Tinley Park. For a hotel that is near the First Midwest Bank Amphitheatre, check out the Hampton Inn Chicago / Tinley Park or the La Quinta Inn & Suites Chicago Tinley Park. The Hampton Inn Chicago / Tinley Park is 2 kilometres (2 miles) away and the La Quinta Inn & Suites Chicago Tinley Park is 3 kilometres (2 miles) away. 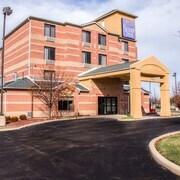 2 kilometres (1 mile) from the middle of Tinley Park is the Comfort Inn and Suites. This is a a great option for tourists who are looking for economical options. 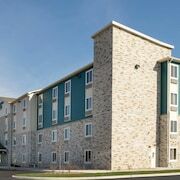 The Wingate by Wyndham Tinley Park is an alternative cost-effective place to stay here. You could also check out the Chicago Marriott Midway and also the Residence Inn Marriott Chicago Midway. The Chicago Marriott Midway is situated 25 kilometres (14 miles) away from the heart of Tinley Park. 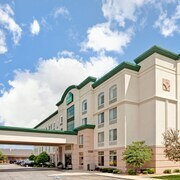 The Residence Inn Marriott Chicago Midway, is situated 25 kilometres (14 miles) away. Some other Expedia-listed accommodations include the Courtyard Chicago Midway Airport and the Holiday Inn Chicago Midway Airport. Schaumburg is 55 kilometres (35 miles) to the northwest of Tinley Park and is where you'll find Woodfield Mall and Legoland Discovery Center. Should you wish to spend a few nights in Schaumburg, check out the Renaissance Schaumburg Convention Center Hotel and Residence Inn by Marriott Chicago Schaumburg/Woodfield Mall. Alternatively, you could stay in Algonquin, 80 kilometres (49 miles) to the northwest of Tinley Park, where you can choose from the Holiday Inn Express Hotel & Suites Chicago-Algonquin and Victorian Rose Garden. The Terrace Hill Golf Course and Raging Buffalo Snowboard Ski Park are a couple of the popular places to experience for those visiting Algonquin. 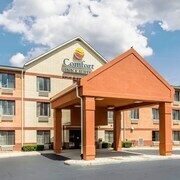 Thank you for checking out our Tinley Park accommodation page. Now, make sure you spend a little time exploring our Tinley Park travel guide for great information on this area's many things to see and do. What are the most popular Tinley Park hotels? Are there hotels in other cities near Tinley Park? 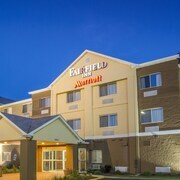 What other types of accommodations are available in Tinley Park? Explore Tinley Park with Expedia.ca’s Travel Guides to find the best flights, cars, holiday packages and more!